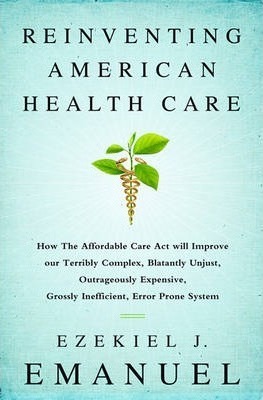 The definitive story of American health care today--its causes, consequences, and confusions In March 2010, the Affordable Care Act was signed into law. It was the most extensive reform of America's health care system since at least the creation of Medicare in 1965, and maybe ever. The ACA was controversial and highly political, and the law faced legal challenges reaching all the way to the Supreme Court; it even precipitated a government shutdown. It was a signature piece of legislation for President Obama's first term, and also a ball and chain for his second. Ezekiel J. Emanuel, a professor of medical ethics and health policy at the University of Pennsylvania who also served as a special adviser to the White House on health care reform, has written a brilliant diagnostic explanation of why health care in America has become such a divisive social issue, how money and medicine have their own--quite distinct--American story, and why reform has bedeviled presidents of the left and right for more than one hundred years. Emanuel also explains exactly how the ACA reforms are reshaping the health care system now. He forecasts the future, identifying six mega trends in health that will determine the market for health care to 2020 and beyond. His predictions are bold, provocative, and uniquely well-informed. Health care--one of America's largest employment sectors, with an economy the size of the GDP of France--has never had a more comprehensive or authoritative interpreter. Ezekiel J. Emanuel is vice provost for global initiatives and chair of the department of medical ethics and health policy at the University of Pennsylvania. From January 2009 to January 2011, he was a special adviser on health care reform to the White House. He is the author or editor of ten books and over 250 scientific articles. He is currently a senior fellow at the Center for American Progress, a columnist for the New York Times, a regular contributor to the Wall Street Journal, contributing editor at The New Republic, and appears regularly on television, including Morning Joe, Real Time with Bill Maher, Hardball with Chris Matthews, and the Rachel Maddow Show.